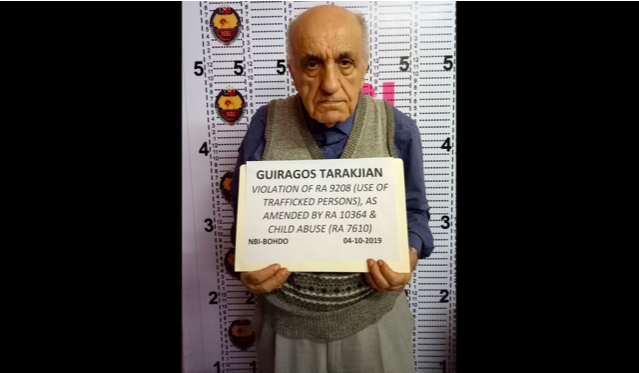 An 86-year-old Lebanese man and his driver have been arrested in Tagbiliran City, Bohol, on suspicion of sexually abusing children. NBI-Bohol Director Rennan Augustus Oliva has identified the suspects as Guiragos Tarakjian from Lebanon and Handel Sarabosing. Charges for violating the Expanded Anti-Trafficking In Persons Act of 2012, and the Special Protection of Children Against Child Abuse, Exploitation and Discrimination Act are now set to be filed against them. Both men have denied the allegations. “I don’t touch anybody,” Tarakjian said. According to the Inquirer, he said he simply gave the children gifts before sending them home. Sarabosing also denied involvement in any wrongdoing, saying he was just asked to transport the children. The two men were arrested after the parents of three children — aged 12 and 13 — filed complaints about the suspects. They described how Sarabosing, a tourist driver, told them that Tarakjian was looking for children to help him at his house. The parents trusted Sarabosing and allowed their children to go with him. “The parents were misled to think the intention of the foreigner was genuine. All the while there was a hidden agenda,” said Officer Oliva today (Thursday, April 11). CCTV footage obtained by the NBI showed Sarabosing coming out of Tarakjian’s rented room at a city resort. When he returned, he was in the company of the three children. After the youngsters got home, they told their parents that they had been molested by Tarakjian. Officer Oliva urged parents to remain vigilant: “Since our province is a tourist destination, the parents should be vigilant in protecting their children because they are prone to these kinds of crimes.